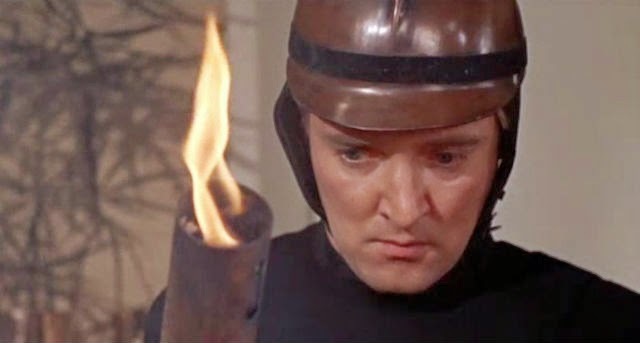 'Fahrenheit 451' is the fourth film in the Blind Spot Series with TheMatinee.Ca. You can see my blind spot movies list in the right hand side bar. Blind spots are films that I've never seen before and are posted on the last Tuesday of the month. The first film on my list was 'Quest for Fire,' the second blind spot was 'Attack of the 50'-Foot Woman,' the third blind spot was 'THX-1138.' 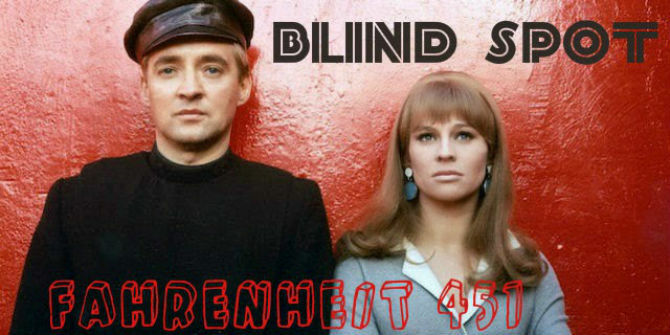 This month's blind spot is 'Fahrenheit 451' (1966). Next month's blind spot is 'The Innocents' (1961). A man receives an alarming phone call warning him to leave his home immediately. Just as he escapes, a firetruck arrives. The fireman aren't there to put out a fire. They rummage through the man's house looking for contraband. The contraband is books. Once the firemen find all of the books in the apartment, they take it out to be burned. 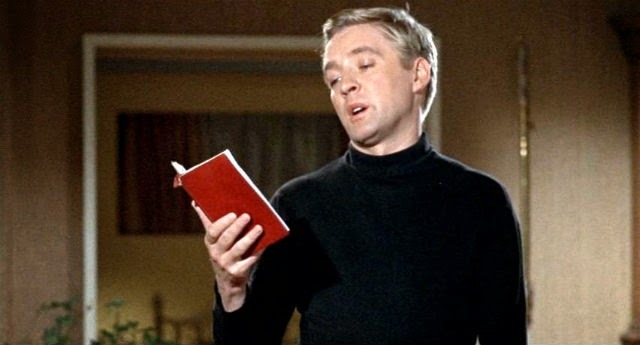 Guy Montag (Oskar Werner) is a fireman whose sole purpose is to burn books. Instead of water hoses firemen carry hoses filled with petrol. Fahrenheit 451 is the temperature at which book paper burns. This is where the movie (and the book it's based on) get its name. In this dystopian future, firemen no longer put out fires, as most homes are fireproof. Fireman have been tasked to burn books--all books. Montag never seems to doubt his job as a fireman until his neighbor, Clarisse (Julie Christie) chats him up on the monorail. He's never spoke to Clarisse before, yet she speaks with him like she would an old friend. Clarisse challenges Montag. Does he ever read the books he burns? Why are books forbidden? Why is Montag a fireman? Why does he hate books. 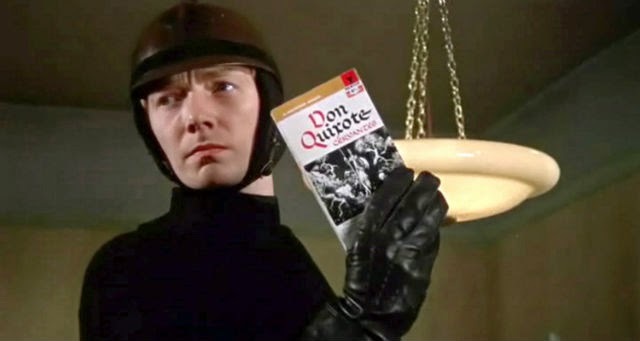 Montag believes that books have been outlawed because they make people unhappy, rebellious, and anti-social. Montag arrives home to Linda his wife (also played by Julie Christie). Where Clarisse is deep thinking and intuitive, Linda is a shallow pill popper. Linda spends her days watching an interactive television show called "The Family," which calls its viewers "Cousins." One evening Montag finds her unconscious and dials for emergency services, but the emergency services are not particularly helpful. As a fireman in this world Montag doesn't appear to have any life saving skills. Instead of a doctor, the "blood men" arrive and give her a transfusion. She lays unconscious as Montag worries. Linda looks near death, but she amazingly wakes up in the morning like some form of Stepford wife. Linda is famished for food and "company." It's at this point that Montag starts to illicitly collect books. I'm sure there is much more to the "blood men" and the miraculous blood transfusions in the book. This was perhaps the most intriguing scene in the film, but instead of delving more into it, the film just glosses over it. The first book Montag reads is 'David Copperfield' by Charles Dickens. After reading his first book, Montag can no longer stomach the government he works for. Montag starts to look at the world he's in differently. While on the monorail he sees the incessant pill popping of fellow passengers and he's disgusted. This is not the only thing that bothers Montag. Compared to the fireman, the police are even more abusive. A toy is taken away from a baby, police feel a pregnant woman to make sure she's actually pregnant and not hiding something, they go through a grandmother's picnic basket, and grab a long-haired boy to shave his head. Montag can no longer bear the society he lives in. Clarisse and similar thinking people start to notice his discomfort and try to reach out to him. Clarisse makes it a point to run into Montag again. She tells him that she's a school teacher and that she's lost her job for not staying on schedule. She tries to have fun with her students in their drab little school. This is a big no no. They go to a coffee shop to talk and see a man anonymously report a book owner in one of the drop boxes across the street. He has to take a stimulant pill for courage. Clarisse is upset by this, which leads Montag to encourage her to try to get her job back. Fearful, Clarisse begs Montag to go with her. When her trip to the school is unsuccessful she demands to know why Montag has chosen this profession? He finally confesses to Clarisse that he just read his first book. When the fireman visit the home of a woman with an extensive book collection, Montag looks at all of the books with wonder as he has never seen so many book in one place. Seeing the woman's passion for her books deeply affects Montag. The Captain has a private talk with Montag in an attempt to dissuade of him of any future book use. As the Captain goes through the woman's book collection with little regard, Montag manages to secretly stash a book in his bag. The books are so plentiful that the fireman decide to burn the entire house down. The book woman decides to burn along with her extensive book collection. Montag is deeply moved by the woman's martyrdom. Montag returns home to find Linda with her friends watching "The Family." Linda wants Montag to join them, but Montag is in no mood for Linda's superficial antics. Montag confronts the women's indifference and tells them the story of the woman he saw burn alive with her books. The women think Montag's joking. He asks them where their husbands are. They've been told their husbands are off at field trials. Montag tells them that their husbands are really fighting wars that no one knows about. When Montag brings out a book and begins to read to them, one of the ladies begins to cry, as her repressed feelings surface. The rest of the women flee, accusing Montag of cruelty. 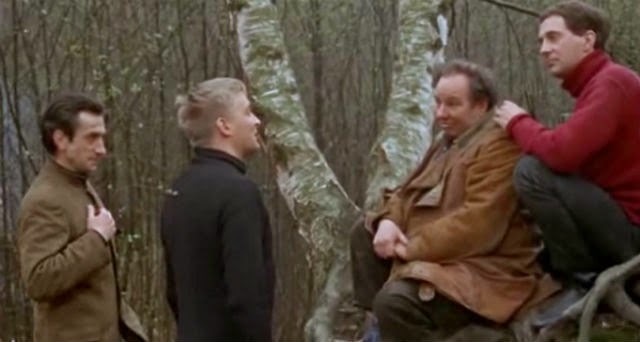 This was another scene that could have been expanded on, but instead of expanding on scenes like this, the film focuses too much on burgeoning romance between Montag and Clarisse. After a night of fitful dreams, Linda demands that Montag get rid of the book or she will leave him. Montag's world may be unraveling, but Linda is worried about being a social outcast. And there's nothing worse than being an unpopular housewife in this town. Doesn't he get it? Not receiving a sympathetic ear from Linda, Montag goes to Clarisse's house only to find it boarded up. 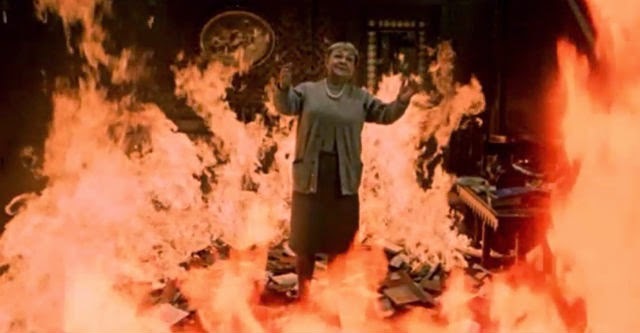 The fireman were sent to Clarisse's house to burn her books. The neighbors turned her in as she didn't have a television antenna on her house. Thus, she was likely one of those "book readers." Clarisse escapes through a trap door with the help of her uncle. Montag eventually finds Clarisse. Clarisse tells Montag her group's true purpose. Each member of her group commits one full book to memory in order to pass it on, in the hopes of a day when books are no longer illegal. If that's the case then I'm not sure why they have so many books? Wouldn't they just have the one? Also, why not have an antenna on your house, if only to keep up with appearances? Wanting to leave with Clarisse, Montag tries to quit his job as a fireman, but his Captain demands he come along for one last book burn. Montag is surprised when the firemen arrive at his own home. He arrives just as Linda declares that she's leaving him. The Captain forces Montag to find his own books and burn them. Montag manages to hide one book to keep for himself. The Captain lectures Montag. He tells Montag that "novels aren't life. There's enough gibberish in them to drive a man mad. Let this heap of contradiction burn itself out." When the Captain finds Montag's secret book he no longer tries to reform Montag, but decides to arrest him. Note to Captain: Never try to arrest a man with a flame thrower in his hand. Montag burns the Captain alive and burns the rest of the house down along with it. He goes in search of Clarisse. 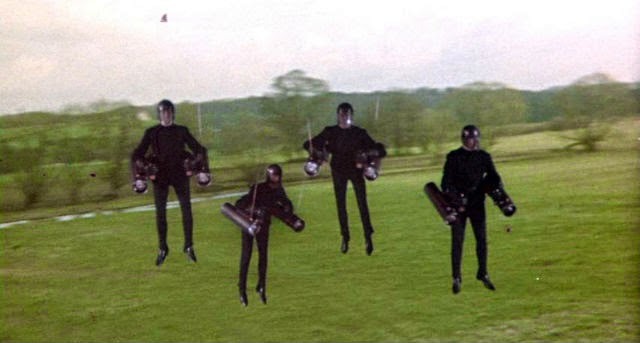 There's a weird little scene when the authorities take to the air in these strangely designed jetpacks. 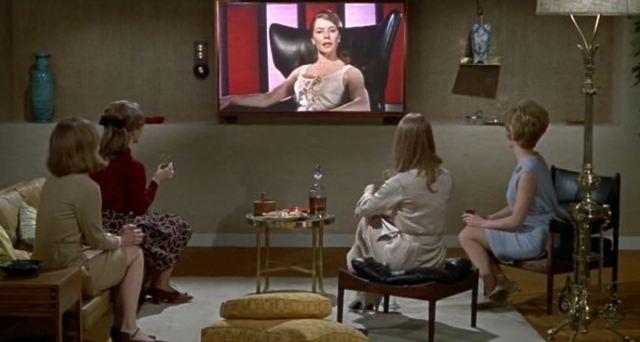 This is one of those scenes that you can tell you're watching a movie from the 1960s. Montag finally finds fellow "book people" in their commune and joins them. They show Montag a television in which "The Family" fakes Montag's death on live television. The government cannot be seen to allow a "criminal" like Montag to escape. When Montag is introduced to the rest of the book people he realizes that the book people do not have names. They go by the names of the books they have memorized. Montag is eventually reunited with Clarisse. Montag decides to become "Tales of Mystery and Imagination" by Edgar Allen Poe. The end. 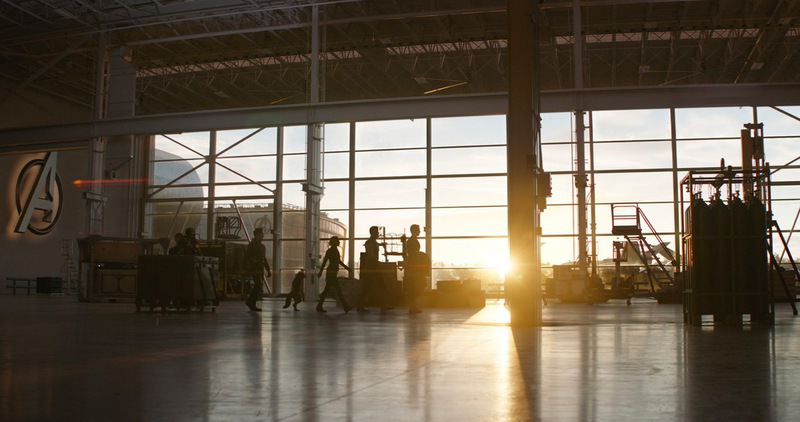 The movie has a retro colorful futuristic feel, which is typical of the 1960s era. At times it could feel dated. Unlike other scifi classics this is not a film that stands the test of time. 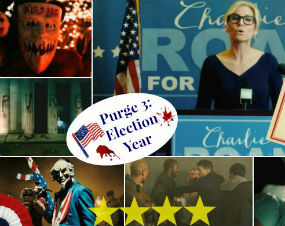 It's a standard dystopian film, similar to '1984. 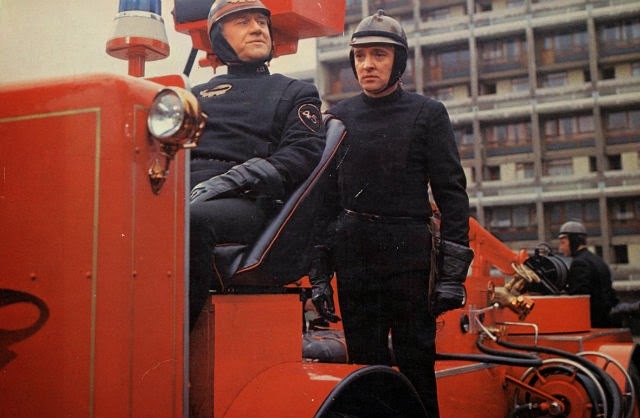 'I believe that 'Fahrenheit 451' predates the film 1984, but not the novel. 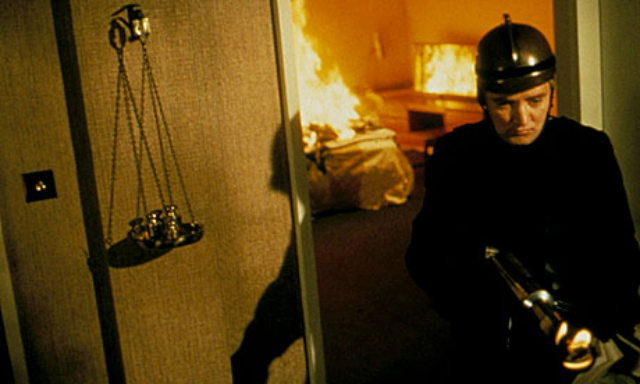 'Fahrenheit 451' is another film that I'm sure influenced the scifi cult film, 'Equilibrium. 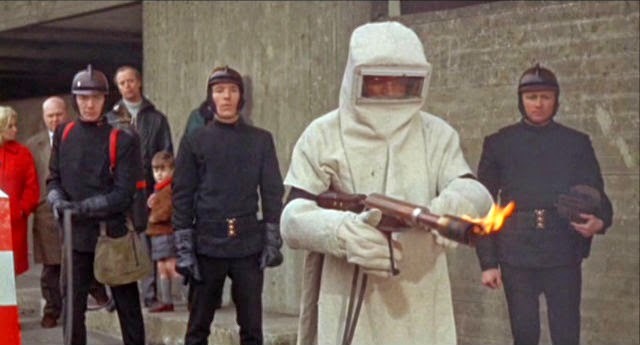 Overall, I enjoyed 'Fahrenheit 451,' but it's not a film I would want to see again. 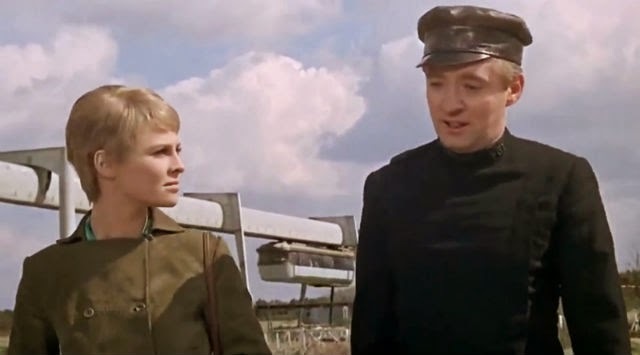 Oskar Werner did a good job as the conflicted Montag. Julie Christie did a good job in her dual role, although I'm not quite sure why she had a dual role. 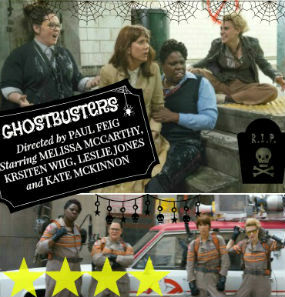 Why wouldn't they have cast two different people? Was it easier for the audience to accept the possibility of Montag cheating on his wife with Clarisse, simply because she was played by the same actress? I know that 'Fahrenheit 451' is supposed to be a social commentary and a dystopian future, but there's still a big plot hole. No fireman to fight fires? Human civilization has had some form of fireman for millennia. Also, the whole fireproof concept sounds pretty ludicrous. I'm not aware of much of anything being completely fireproof except stainless steel. As I said, the most interesting aspect of the movie was the blood transfusions and that was glossed over. Lastly, the final scene shows the book people living a very spartan lifestyle in the woods. Their only enjoyment seems to be reciting their books, whilst dressed in rags. 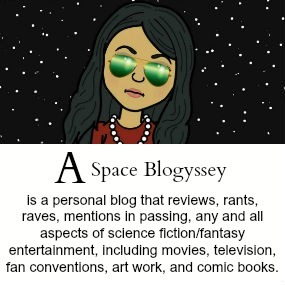 I wish the book people had better lives, but you can't take the "dys" out of "dysptopia." I much preferred the book lovers refuge at the end of 'The Book of Eli.' Perhaps I'm shallow, but I think I would have ended up giving up books. It's been many years since I watched the film. You're right that it shares a lot with Equilibrium. Hi Alex-- Yes, 'Equilibrium' reminds me of both 'Fahrenheit 451' and 'THX-1138.' 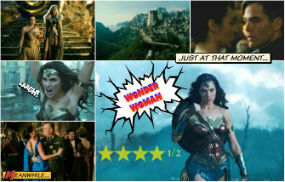 It was good to watch...once. I won't watch it again. If hollywood was into the remake business this would be one that would be great to do. I remember reading it in high school and was so disappointed in the movie. Yeah, the movie didn't really do it for me. I had a feeling that the book must have been so much better. Excellent post as ever. 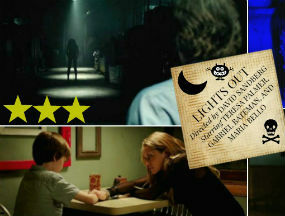 I liked the film when I saw it years ago, there was a detachedness to it that I thought fitted well. I left the science at the door. Ray bradbury was more a poet than a scientist. Oh thank you Paul. Yes, I thought it was somewhat detached. That's a fair point to make about Bradbury. It was poetic wasn't it? 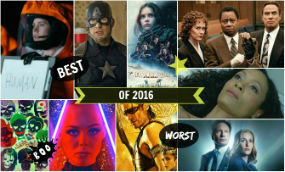 So many wonderful films I haven't seen. Yeah the idea of firefighters going away is a stretch. Me too. I'm really getting a film education through the blind spot series. I think Paul hit the nail on the head, 'Fahrenheit 451' is more of a poem than a movie. If I look it at that then it makes sense.